William the Silent, the first head of state to be assassinated with a handgun, became Prince of Orange on 15 July 1544. In 1559, William was appointed stadtholder of the provinces of Holland, Zeeland, Utrecht and Burgundy. From August to October 1566, a wave of iconoclasm (Beeldenstorm) was rife throughout the Low Countries. In April 1567, William refused to appear before the committee investigating the Beeldenstorm. He was publicly outlawed and his property confiscated. However, William remained popular among the common people in no small thanks to a propaganda campaign, so William was reinstated as the stadtholder of Holland and Zeeland. 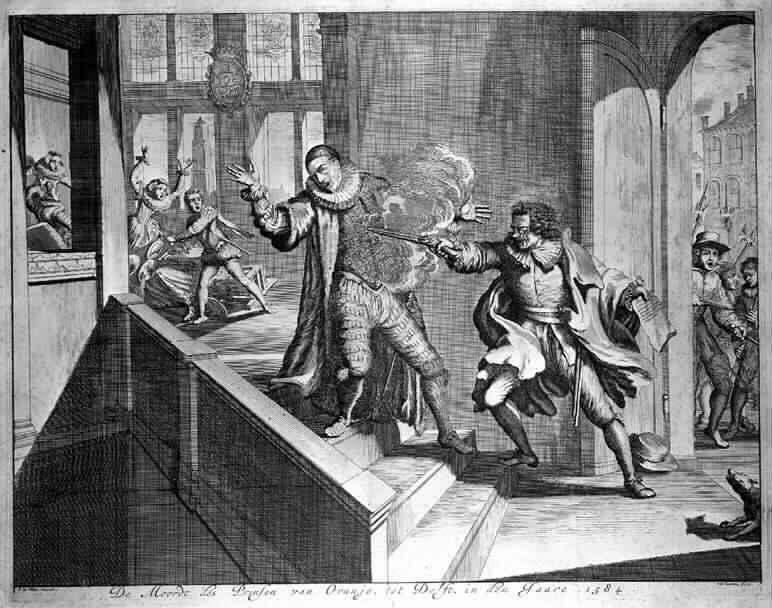 On 18 March 1582, after an al fresco lunch, 18-year-old Juan de Jauregui, a Spaniard, shot William but the pistol had been loaded with too much gunpowder and it exploded, throwing de Jauregui backwards and blowing off his thumb. The bullet entered William’s face at an upward trajectory and somehow missed his teeth and tongue and exited through his cheek. William’s aides immediately stabbed de Jauregui to death. His body was decapitated and his torso cut into four and displayed on the Antwerp city walls. Later William said he had no recollection of being shot and had thought the roof had fallen on his head. Rumours immediately circulated Europe that William had died or was close to death and, indeed, he was not seen in public for many months. Gerard was arrested while attempting to escape over a garden wall and imprisoned. He was tortured before his trial on 13 July. After being racked, his right arm was burned off with a red-hot iron. His body was then flayed with red-hot pincers, his abdomen sliced open and his bowels ripped out before his legs and remaining arm were hacked off. He is reported to have been alive until his heart was torn out and thrown in his face. It is said that Gerard remained silent throughout the ordeal. Dutch Catholics, happy in William’s death, kept Gerard’s head as a relic and sought to have him made a saint.